1. Law as a Category of Social Mediation between Facts and Norms. 2. The Sociology of Law versus the Philosophy of Justice. 3. A Reconstructive Approach to Law I: The System of Rights. 4. A Reconstructive Approach to Law II: The Principles of the Constitutional State. 5. The Indeterminacy of Law and the Rationality of Adjudication. 6. Judiciary and Legislature: On the Role and Legitimacy of Constitutional Adjudication. 7. Deliberative Politics: A Procedural Concept of Democracy. 8. Civil Society and the Political Public Sphere. 9. Paradigms of Law. Postscript (1994). * This is Habermas's long-awaited work on law and democracy. * It develops a distinctive account of the nature of law and an original concept of democracy. 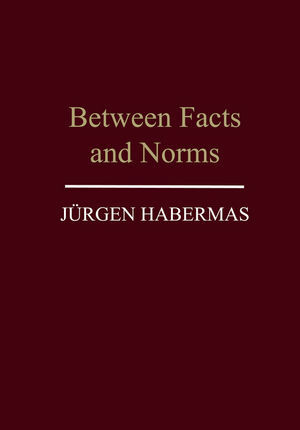 * As one of Habermas's most important works, it will be recognized as a major contribution to current debates in social theory, political theory, and philosophy.